Chris and Christine had such a fun wedding! They had a great wedding party! We try to get everyone involved as much as we can! Their wedding was September 10th, 2016. The ceremony was at St. Peter's RC Church in Lewiston, NY. We went for photos at Hotel Henry in Buffalo. It was under construction, so we couldn't go in. But we got to work all around the grounds and got some amazing photos! The reception was at Hotel at the Lafayette in downtown Buffalo. It is such a great wedding venue! We always like to do one last photo shoot at some point during the reception with the bride and groom. Neal had a great idea for Chris and Christine. It was based on their red carpet style engagement session we did at the Statler. There were spotlight style lights in the lobby, so we made the couple look like they were movie stars. To continue the same theme for the wedding, he wanted to wedding party to be paparazzi! 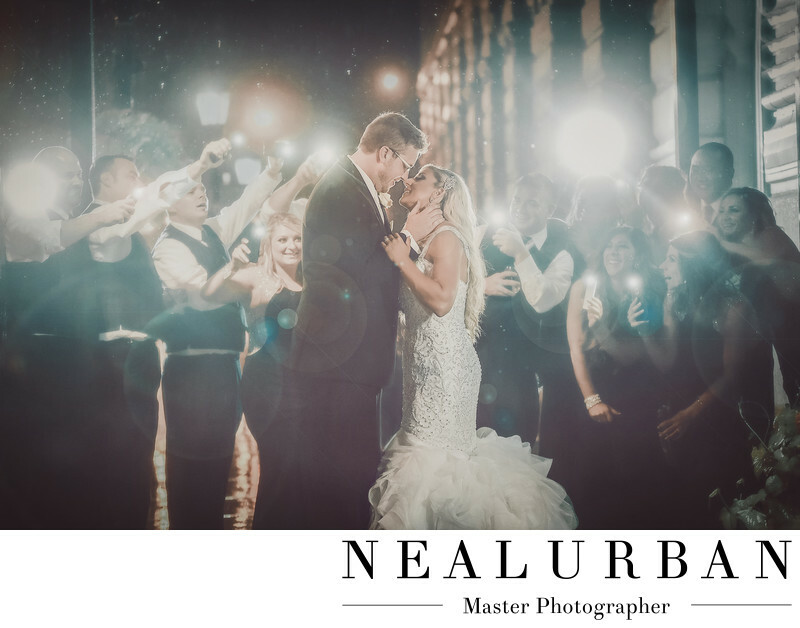 Since everyone always has their phones with them and out at weddings, we thought they could all use their flashlights and pretty much mob the happy couple. We brought the bride and groom and wedding party outside. It was raining pretty bad, so we kept them under the awning. We had to set up some extra lighting behind everyone and also on Chris and Christine, so they would stand out a little better. Once everything was in place, we had the party turn their lights and and go crazy. We had the newlyweds have a couple and enjoy being surrounded by their close friends and family. That was a wrap for us! We were completely soaked. We had to stand in the rain to get the shot a for lighting. It was so worth it! We wanted to effect to look like camera flashes going off! The bridesmaids in the bottom corner are hysterical. They could not stop laughing and we loved their reactions! We always try to come up with one last creative image. It could be inside or outside the venue. Maybe across the street. Who knows! It all depends on what we see that day and what we think will fit the couple!